Sealcoating improves the appearance of asphalt pavement by providing a uniform black color. It will add to the beauty of your commercial or residential space, as well as protect the surface against the elements of weather. If left untreated over time, the combined effects of ice, salt, rain, sleet, snow, sun, oil and gasoline will eventually damage or destroy asphalt pavements. The binding agents can be dried of of the asphalt mix from sun and oxidation. This can also cause the pavement to be left brittle. Loose aggregate can ravel and the surface may become rough and faded. Rain and water from run-off further erode pavement, weaken the asphalt (which leads to cracks) and allow water to penetrate the asphalt base and cause pavement failure. Needless to say, parking lot repairs can be expensive. The cost of asphalt has a direct relationship to the cost of oil. As the price of oil goes up, so does the price of asphalt. For this reason, it is very important to preserve your parking lot and/or driveway for as long as you possibly can. Sealcoating will protect the asphalt pavement from all of the elements. Sealcoat materials are designed for use depending on pavement condition, type of traffic and budget requirements. 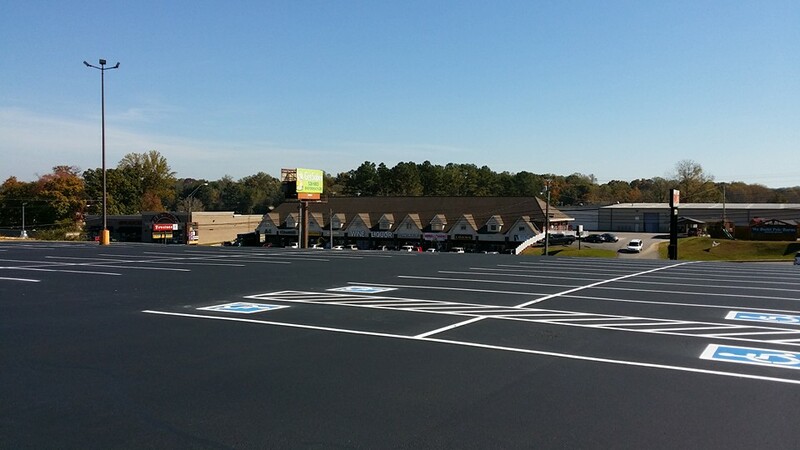 Sealcoat materials are available in different grades and should be re-applied on a regular basis. Regular sealcoating can extend your asphalt pavement life and produce an enormous savings in maintenance costs. Cracks being to appear as asphalt pavement ages. These cracks need to be addressed before any surface treatment is started. Crack sealing is one of the best early preventative maintenance measures to prolong asphalt life. “Working” cracks 1/4 inch and wider should be sealed. There is very little benefit in sealing “alligator” or fatigue type cracks, as these usually indicate base failure. Cracks must be dry and thoroughly cleaned prior to sealing. There are several options available, including the use of: wire wheels, compressed air, hot air lance and propane fired torch. Hot-applied, rubberized crack sealant compound is machine applied directly into the crack. This process is known as “over banding.” Due to the high elasticity of the crack sealant, the resulting repair expands and contracts with the pavement, which helps keep water out of the base.